Objective The object of Golf is to transfer all the cards from the seven columns to the single waste pile as quickly as possible. That's all there is to it ! Child's play hey ? Sure you don't want to play tiddly-winks instead ? Golf Rules All building is carried out on the single waste pile. A single, exposed card from one of the seven columns may be transferred to the waste pile if it follows either an ascending or descending sequence regardless of suit. So in the above example, either the 5 or the 7 may be built on the 6. 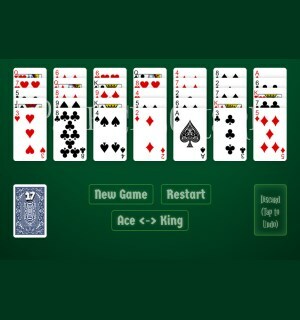 Sequences may turn the corner with Kings building on Aces and Aces building on Kings. When no more cards from the columns can be transferred to the waste pile, a card from the stock is dealt to the waste pile and building resumes. When the stock is exhausted, and no more building can occur, then the game is over. When playing Rules 1 and 2, for your first move you may play any of the exposed column cards to the waste pile to get the ball rolling, so you'll have to scan the cards really quickly to see which card might release the best initial sequence. For all other rules, an initial card is dealt from the stock to the waste pile so you have to build on that. Be aware that your score is entirely proportional to the time you take to clear out the columns, so you're gonna have to motor ! My personal best on Rule 1 is 43 seconds and I was flying. Sub-minute times seem impossible at first, but if you keep playing Golf endlessly, you find yourself playing on instinct and scanning several moves ahead. It can get quite frantic ! Don't forget, you can double click or right click on a card to send it flying to the waste pile.